Tales from a summer camp...: The back-story to the Asifa. What was Rabbi Gottlieb's true agenda? The back-story to the Asifa. What was Rabbi Gottlieb's true agenda? "Sof davar, hakkol nishma – “The end of the matter (is) that hakkol, 'everything' is heard”. - King Solomon. I would consider this my first guest post from an anonymous person. As you well know I dont aprove of anonymouses, but since I can validate most of the information I believe this information is true and so I decided to post it on my blog. This is a translation from a Yidish post found on this blog. "CIRCUS TENT הירשל ציג'ס בלאג "מהנעשה מאחורי הפרגוד ביי די "איחוד הקהילות לטוהר המחנה" - באקומען אין אן אי-מייל. I don't take responsibly for whats written on another persons blog, but he has been proven correct with his coverage of the Asifa so far. And it seems that the Yidish olem in general are privileged to more inside information. I have lots more disturbing information on whats going behind the scenes, but I have decided not to post it, because some people accuse me of taking this all personally. I hope the truth all comes out at the end, Klal Yisroel deserves that! So as Paul Harvey would say I now present to you "The Rest of the Story!" What went on behind the scenes by the Internet Asifa – as reported in an e-mail. A bit of truth what is going on behind the scenes by the preparations for the Internet Asifa, as it creates a serious battle and power struggle between the Chasidishe Askanim, who are being dragged to the Asifa, and the organizer of the Asifa and what will follow, Nechemya Gottlieb. The preparations for the Asifa have been in the works for over a year. The idea for the Asifa was hatched by a Litvisher Askan who recently appeared on the horizon, Reb Nechemya Gottlieb, whose goal is to create an easy and respectable livelihood, so that he can marry off his children with sufficient money and without any extra stresses. His plan is to open an organization or company, whatever it will be called, that will have control over the technology of the entire spectrum of Chareidi Jewry, and the company would make a lot of money, either through collecting money from people who would like to support such a holy and proper organization, and also through charging to install filters and other spiritual protections for all computers. But how does one insure that all of Klall Yisroel will submit to Mr. Gottlieb? This was Gottlieb’s idea, to make an Asifa supported by the Gedolei Torah and Klall Yisroel, and to invite all sectors of Chareidi Jewry, and there to force everyone to submit themselves to the new organization, and through the strong foundation established by the important Asifa, R’ Nechemya will become a well respected Jew, and also a successful businessman. However, as it happened, he had trouble gathering support for the Asifa from the important Askanim, not to mention the holy Gedolei Yisroel, whom R’ Nechemya could not entice to lend support. Accordingly, over the course of a few long months, it became apparent that his idea would fail, to the extent that, after Pesach, not one Kehilla in Klall Yisroel agreed to join in the Asifa, which was a colossal failure for R’ Nechemya and also for the Gedolei Yisroel who were involved in trying their best to stem the plague of technology. At the same time that R’ Nechemya saw himself in great danger of failing in his plan to make a lot of money, a number of private computer technicians were continuing to perform their jobs without any connection to the upcoming Asifa, and they scheduled an event in the Karlsburger Bais Hamedrash, where people could come and obtain filters for their computers to restrict access to the internet. This event was a phenomenal success and was endorsed by HaGoan Reb Yechezkel Roth and other Rabbanim, and through the night, the technicians protected and made kosher hundreds of computers. Nechemya went wildly mad, and determined to do everything possible to prevent such events from taking place in the future even though such events could save hundreds, and possibly thousands of Jews from the internet, this was not important to Nechemya because his goal was easy business and these events stood to destroy his livelihood. So he went to the length and breadth to uproot the group of technicians who were working for free [at these events], with all types of terror and pressure until he succeeded in stopping further events [at which filters were being installed on computers] from occurring. (The chutzpa is incomprehensible, because today, Nechemya is taking credit for the Asifa, when his only connection with it was that he successfully brought it about.) Returning now to the Internet Asifa, which appeared to be a catastrophe and failure and an embarrassment for the Gedolei Yisroel who became intertwined with it, it was now a number of weeks after Pesach and they still had not sold one ticket, so they gathered a house full of experienced Chasideshe Askanim who B”H put the Asifa on the map, and now, weeks after the new Askanim became involved, the Asifa is sold out. So now Nechemya should be happy because of the work of the experienced Chasideshe Askanim did for him. On the contrary, Nechemya resents them greatly, because Nechemya, who is responsible to bring the Litvisher contingent, has failed. Unlike the Chasidishe contingent, the Litvisher contingent is uninterested in the situation, especially as many of the Roshei Yeshivos from the Litvisher world are not acknowledging the Asifa, and among them, HaGoan Reb Shmuel Kaminetsky and others, Nechemya began to feel as if he lost the power and that the Chasidim gained power, and at the end of last week, Nechemya had an idea to start a war over nothing with the Chasidishe Askanim, and their head, Shlomo Eliezer Meisels! 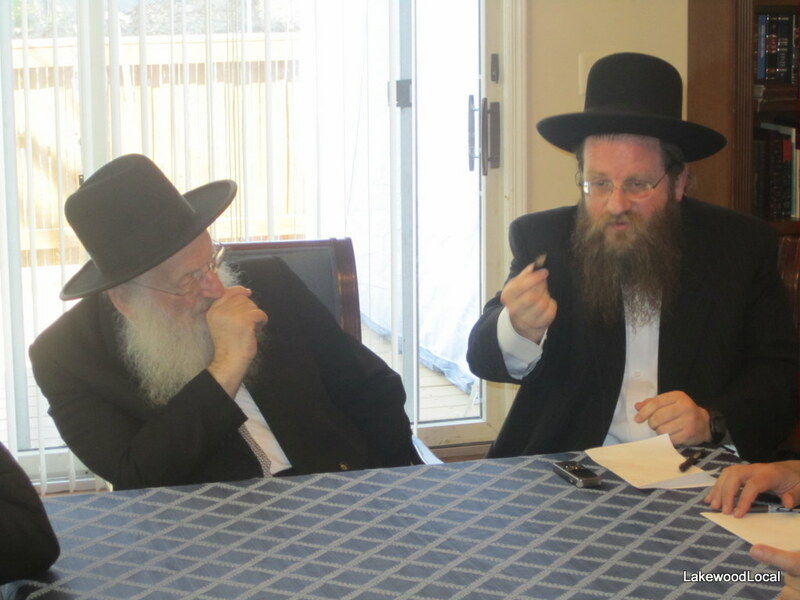 One of the issues over which Nechemya and Shlomo Eliezer fought was, when Nechemya argued that many communities would not patronize his company after the Asifa, therefore, he did not need them, and also that he was not interested that Satmar should participate because, after the Asifa, they would not patronize him anyways. Understandably, Shlomo Eliezer did not agree to his foolishness, and would not let the time, blood and sweat that he invested to try and bring Satmar to the Asifa be destroyed by the Litvisher money seeker. The second part of the war related to the publication “Hatzalas Hadoros” which the Chasidishe Askanim published despite Gottlieb’s direction that it not be published and that he would not pay the costs of publication even though the publication already had been printed. Gottlieb sees this as a battle to hold on to his position as the head of the Asifa and the organization which he established and [the advancement of] which is the whole purpose behind the Asifa, and he is complaining far and wide that he will not be sufficiently recognized at the Asifa and that they are making the Skulener Rebbe too great, greater than the Masgiach Reb Mattisyahu Solomon, and he successfully established that the companies did not publish the publication, rather, the Chasideshe Askanim did it by themselves. Meanwhile, they are still arguing. Whatever the Chasidishe Askanim say, Gottlieb says the opposite, if only to show them that he is in charge. Tickets that were supposed to go to Williamsburg went instead to Flatbush. And when the tickets are sold out, the Askanim will advise where everyone should sit through seaters, etc. however, Gottlieb is in charge of the money, and there is no other way, and he is not ashamed to say clearly that the reason for this is all the Jews over whom he can have control have already reserved tickets, and he doesn’t need any of the latecomers. They are also battling over the expo which has to be one of the greatest partnerships for Gottlieb’s organization, however, things are not going as planned, and he is blaming the Chasidishe Askanim that they are focusing on the unimportant (the Asifa) instead of focusing on the important (his company’s expo). Now the Askanim are counting the days until this coming Sunday after the Asifa, when they will be free of the dictatorship of Nechemya Gottlieb, and he will have to run his business alone, and let’s see how far he gets with his money seeking ways. And yet with all this information and the many allegations of physical abuse, the Mishpacha Magazine publishes the following cover up article. Its unfortunate but the orthodox papers cant be trusted. Feel free to comment below. But be careful not to make allegations that you cant back up with facts. "Feel free to comment below. But be careful not to make allegations that you cant back up with facts." LOL!! After an entire post with ZERO facts, you write this?? How sad that you cannot see what a caricature you've become. "Says a close friend of Rabbi Gotllieb." "I try not to allow myself or my family to read anything that might contain loshon harah, whether it be printed in the tabloids or on so called kosher news sites." ??????????? Congrats, Dovid. You really out did yourself big time. Mamesh Azah juicy shtikel Loshon Hara, I haven't heard in a long time. The Ribono Shel Olam is surely shepping nachas from you. Your father is mamesh kvelling from simcha that his son is so dedicated to fixing the problems of klal yisroel with all this loshon hara, rechilus and motzi shem ra. Guess what, its also a fact that facts are also loshon hara. What a sore loser, teitel-bum. You ranted and railed against this asifa, you were mevaze talmidei chachomim in the process, you hoped it would flop and tickets wouldn't sell, and then smack on your face - not just sold out, but they rented a second stadium. You couldn't handle it, so you decided to take revenge - post a geshmake piece of loshon hara "facts" to make em look bad. HItler would of been so proud of you. He would've made you chief editor of Der Sturmer. Do us a favor, and stop playing this "I-am-really-frum-and-I-try-not-to-read-anything-that-might-contain-loshon-harah"
Come out of the closet and admit that you don't give a damn about loshon hara. Halacha. Facts are not loshon harah when there is a toeles for the public to know about it. Never met the guy or spoke to him. Don't know him from beans. What happened to not accusing without "facts"? Do you have any facts to back up what you've written or is it all hearsay? Sorry I was just speculating as you wont tell us who you are. I thought you said not to accuse without backing up with facts? Standards for thee, not for me. I hope you realize that any objective observer can see right through your shtick and easily discern your agenda. All the facts are backed up. Im not sure what part your disputing. You jerk! Get off the Jews! Teitelbaum, your a peice of s...! Go to help! caught up in your haughty pride and ego, you can't see past your unfiltered nose. So if a scam will go on regardless we shouldnt say anything? I would like to feel that I did my part even if everyone shows. Im no mordechai but he didnt seem to care to warn the Jews about going to achashveirosh party even though nobody listens. And by the way its people like you that are providing the arsenal. I might just be reporting the facts, so please dont blame me for it. How are your facts backed up. Where's the proof? Someone says so? Oh and I thought you hated anonymous comments. You do know that Circus Tent is anonymous blog and that "Hershel Tzig" is not his real name? And the accuser in this post, is HIS name mentioned? What happened to the "halacha" that the accused has a right to know his accuser? The Fathers Are All Going To CitiField, The Mothers Are All Going To live Hookups, & The kids Will Stay Home Alone On The Computer! Like I said. I know all the information on my own to be true. You still haven challenged one part of it. Your going to be late for the Asifa, get going. why don't you pull in some of the neighborhood techs who were shut down and to describe in what way. i am an "on the fencer" about all this. this is just hearsay. better - let's get them some play online and get them available for contact and work again to do what they were doing for free. then this whole conversation would be unnecessary. - why aren't they creating a forum online for us to find out all the info the Ichud may start charging us for? All I see here is you trying to create a witty response. And in doing so you just told a fellow jew that that they would have made HITLER proud?? Are you serious? Whether you agree with someone or not, whether or not they are right wrong, how dare you say that someone who is responsible for the deaths of over 6 million jews would have proud. I'm not religious or anything, I don't really know much about halacha and who is right or wrong here but take a step back and look at what you are saying. This has literally ruined my night that a jew can say that to another.